(2015). Colour Emotion Models, CIELAB Colour Coordinates, and Iranian Emotional Responses. Journal of Textiles and Polymers, 3(2), 46-54.
. "Colour Emotion Models, CIELAB Colour Coordinates, and Iranian Emotional Responses". Journal of Textiles and Polymers, 3, 2, 2015, 46-54. (2015). 'Colour Emotion Models, CIELAB Colour Coordinates, and Iranian Emotional Responses', Journal of Textiles and Polymers, 3(2), pp. 46-54. Colour Emotion Models, CIELAB Colour Coordinates, and Iranian Emotional Responses. 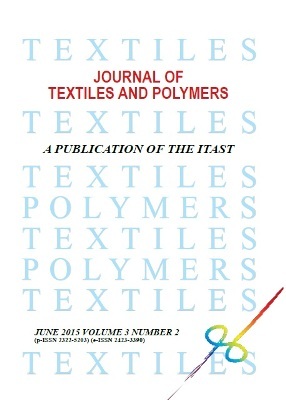 Journal of Textiles and Polymers, 2015; 3(2): 46-54. Ten colour emotional scales, namely, "Warm Cool", "Active-Passive", "Like-Dislike", "Clean-Dirty", "Fresh-Stale", "Modern-Classical", "Heavy-Light", "Hard- Soft", "Tense-Relaxed", and "Masculine-Feminine"are investigated for single-colour stimuli in CIELAB colour space within a psychophysical experiment by forty observers. The relationships between Iranian colour emotional responses and CIELAB colour coordinates are examined. Based on the results, colours with higher values of L*are associated to the emotional words, such as clean, light and soft. Colour with higher C* values are also associated to warm, modern, and masculine emotional words. Iranian colour emotional responses are also assayed in three existed colour emotional models, Li Chen Ou's, Sato's and Xin-Cheng's models, for four colour emotional dimensions, "Warm-Cool", "Heavy- Light", "Active-Passive", and "Hard-Soft" scales. Results show that the Ou's model is a fairly good predictor for "Warm-Cool" scale, while the Xin-Cheng's model is a good predictor for "Heavy-Light" and "Hard-Soft" scales. In "Active-Passive" scale, none of the existed models are found to be a good predictor for Iranian colour emotional dimension.